Corner detection is very useful for shape description and matching. 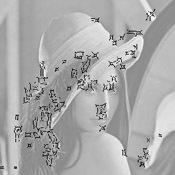 Corner detection works on the principle that if you place a small window over an image, if that window is placed on a corner then if it is moved in any direction there will be a large change in intensity. This is illustrated below with some diagrams. If the window is over a flat area of the image then there will be obviously be no intensity change when the window moves. If the window is over an edge there will only be an intesity change if the window moves in one direction. If the window is over a corner then there will be a change in all directions, and therefore we know there must be a corner. 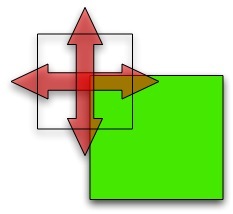 The Harris corner detector, demonstrated above, measures the strength of detected corners, and only marks those above a given strength as actual corners. The number detected can be altered by varying the value of k.
The pages were designed and developed for educational purposes only, to demonstrate how computer vision techniques work. They are designed for no other purpose and neither the authors nor their institutions accept any liability concerning use of these pages.